When the need for building design arises, you’ll need to find architect services to turn your vision into a construction-worthy blueprint. After years of schooling and training, architects have the unique insight to create the building you’re envisioning. Once you’ve found the best architect service in your area, however, you might be confused as to what you can expect from the process. Rather than jumping straight into building codes and logistics, you must refine every detail to achieve a final product that is in line with your particular needs. Use the following information to prepare for the process ahead. After pitching the initial idea for your commercial building, the architects will draw up a rough outline of what the construction may entail. At this stage, you are likely to have a number of questions and changes you’d like to make to their proposal. This is to be expected, as the first draw-up serves to gauge your taste. The mock-up will be redrafted multiple times until it matches your expectations. 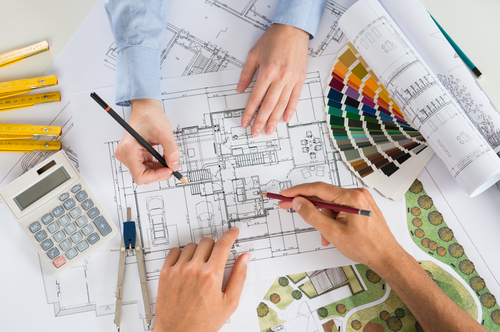 During your first meeting with an architecture firm, you’ll also present your ideas for the building, including any design elements and functional components. Your hired team will use their expertise and training to scrutinize each choice and decide whether or not it is a worthwhile addition to their blueprint. If one of the design elements you propose is unrealistic, unsafe, or illegal, your architect will suggest another option instead. Once you have discussed what type of building you’re hoping to erect and some of the design elements inside, the team will provide a rough estimate as to how long the project will take. Of course, this is only an educated guess, as construction projects involve a number of moving pieces that can shift the date of completion. While you may be wary about the timeline upfront, keep in mind that large commercial buildings require constant attention to detail and should never be rushed. Finding the right architects in Rochester, NY, is as easy as calling Pardi Partnership Architects PC. For 20 years, they have been the area’s leader in comprehensive design, graphics, and engineering consulting. As innovators in their field, they employ a team-based design and build construction ideology, allowing for a smoother process from start to finish. Visit this architect service online now or call them at (585) 454­-4670.